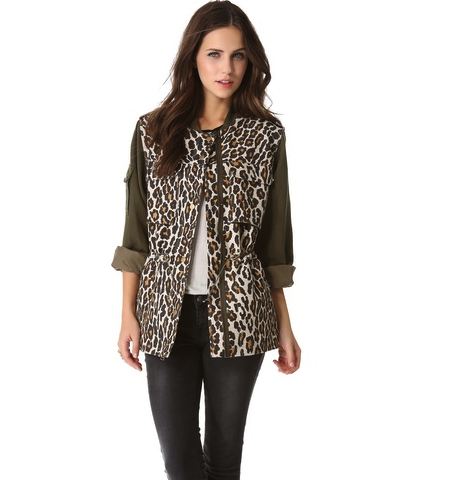 This mixed-texture Sea jacket in Leopard print has a cool, utilitarian feel with Velcro® epaulets and zip and flap pockets. Brass beads cinch the drawstring waist, and a snap panel conceals the zip placket. A snap-flap pocket accents one sleeve. Button cuffs. Lined. Fabric: Smooth & textured weave. Sea is a line of separates and dresses designed by lifelong friends Monica Paolini and Sean Monahan. Monahan launched the label in 2007, after a career in media and technology had run its course. Monica joined the brand in 2009, and together they design this accessible line of feminine, modern pieces, cut in a quietly provocative style. Sea clothing is unique and wearable, the sort of staples every city wardrobe needs.